In an alternate universe where I grew up playing video games instead of collecting action figures, I would probably be doing reviews of the Sonic the Hedgehog comic instead of IDW’s Transformers titles. Archie has been publishing their Sonic comic for an astonishing twenty years -- their longest-running franchise outside of the actual Riverdale books. As a result, it has a complex continuity of its own far removed (and often better) than the various video games. Archie’s Mega Man series is “only” about three years old by comparison, and as a result, it’s closer to what you might remember from the video games and old cartoon show. 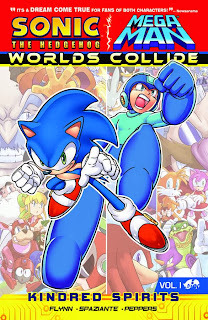 The two series recently came together in a twelve-part story, the first four chapters of which are collected in Sonic/Mega Man: Worlds Collide Vol. 1: Kindred Spirits. Creating a Sonic/Mega Man crossover is fairly simple conceptually. Both franchises revolve around super-powered youngsters fighting mad scientists and their robotic creations. It only took this long to happen because of legal red tape from Capcom, Sega, and other rights holders. What makes the Worlds Collide crossover a worthwhile endeavor is the feeling of importance given to the narrative. This isn’t just some throwaway storyline; it takes up four issues each of Sonic the Hedgehog, Sonic Universe, and Mega Man, giving writer Ian Flynn ample room to explore as many angles as he can. It was even planned to hit two milestone issues: Sonic #250 and Mega Man #25 (and the fiftieth issue of Universe was part of the crossover’s prelude). Despite the huge amount of potential backstory -- especially on the Sonic side -- Worlds Collide is actually very accessible. You really only need to know about the main characters of each franchise and Flynn does a good job of introducing everyone. Wisely, every character gets a short name and function label in their first appearance. Because he has a lot of pages to work with, Flynn is able to save the in-jokes for later, once the story is properly set up. The only time I really got confused was when Mega Man makes a joke about fighting alien robots (an offhand remark about the events of Mega Man 5). Still, the Mobius Encyclopedia and the Mega Man Knowledge Base are handy resources if you get confused about the characters. Often, inter-continuity crossovers are only as strong as their villains; compare, for instance, the use of Lex Luthor and Doctor Octopus in the excellent Superman vs. the Amazing Spider-Man to the dullness of the Joker/Shaper of Worlds team in Batman vs. the Incredible Hulk. Luckily, both franchises in Worlds Collide have some of the most famous villains in video game history. Dr. Eggman and Dr. Wily form the core relationship of the crossover, coming into contact thanks to the strange properties of the power-granting Chaos Emeralds. They quickly get over their egos when they realize the similarity of their situations -- a friendship best demonstrated by a panel labeled “Evil Bro Fist." Both have quirks when it comes to naming their creations: Eggman likes to include “Egg” in everything, while Wily has a penchant for “Skull." Their partnership is established with the creation of the “Skull Egg Zone," a warped pocket of time and space wherein they have total control. One of the odd imbalances of the two franchises is that Sonic the Hedgehog has a lot of heroes, while Mega Man has a lot of villains (since each video game tends to introduce its own set of Robot Masters). Wily and Eggman even the odds by capturing many of Sonic’s friends and turning them into robot slaves called Roboticized Masters. This is one area where I wish Flynn had spent a bit of time explaining “roboticizing," Eggman’s key tactic in which he converts organics into his own robotic soldiers. The lack of context doesn’t really detract from the maneuver, though, as “Tails Man” proves to be a powerful foe until he gets turned back into Sonic’s best friend. Knuckles and Protoman, the series’ respective edgy outsiders, are a little underutilized, but again, there’s still lots of page time left. These first few issues spend some time settling the main question raised by a crossover: who would win in a fight? Sonic and Mega Man are tricked into battling each other thanks to some evil doppelgangers, and Mega Man could defeat Sonic with his cannon . . . if he could lock onto the target. By the same token, Sonic can outrun and disable the cannon, but Mega Man is too powerful once he receives back-up from his robot dog, Rush. This helps define the differences between the heroes: Sonic is brash and arrogant, while Mega Man is confident but calmer. When Tails and Mega Man’s sister, Roll, are using a computer to create a portal, Mega Man cleans up their recently-attacked headquarters, while Sonic naps. They’re both good guys, but their codes of behavior are clearly different. Jamal Peppers is the penciller for three and a half issues. Ryan Jampole takes over for the second half of the final issue, Mega Man #25, but the switch is so imperceptible that I didn’t even notice it until I checked the credits. This should come as no surprise to those who know Archie Comics’ strict usage of a “house style” to keep decades of Archie comics looking nearly identical. Cover artist Patrick Spaziante provides a nice sketch gallery in the back and relates how the crossover nearly happened close to a decade ago when he was drawing Mega Man for Dreamwave. Sonic and Mega Man are such icons both inside and out of video games that I think any comics reader could give Worlds Collide Vol. 1: Kindred Spirits a shot. This book is just the opening salvo for the real fun to come, and while it didn’t quite get me hooked on Archie’s video game output, I really do respect their hard work. It’s also a very kid-friendly book if you want to get a game-obsessed relative into comics. Next week, let’s celebrate Christmas with a dark but deeply spiritual J. Michael Straczynski book.